Our RH-Flex Series automatic tube cutoff machines process raw materials into finished parts in one step. While holding the material stationary, the head rotates to cut off, chamfer, counterbore, face groove and more to produce the exact end finish your part requires. 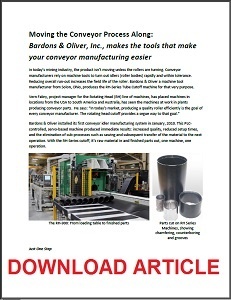 Now difficult-to-process materials, such as long or irregular tubes and bars, can be processed safely and more efficiently. Quick setups are performed from the Operator Control Panel, or HMI. Cutting tool slides, workholding, vises and tube loading and unloading are repositioned using digital servos and hydraulics with linear transducer feedback for incredible flexibility. There is no lost production time for material size adjustment.Two 6-jaw long-stroke chucks and a feed vise travel the full range of the tube cutting machine, which means a wide range of material sizes can be accommodated without resetting tools. Standard interface screens give the operator complete process control. 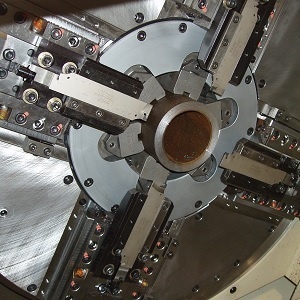 Nesting features give the ability to cut any combination of part lengths on the fly. With a part program storage capacity of over 200 part numbers and the ability to create a job queue of six programs, the Bardons & Oliver RH-Flex Series high performance cutoff machines truly deliver. A tailored system delivers to your specific requirements. 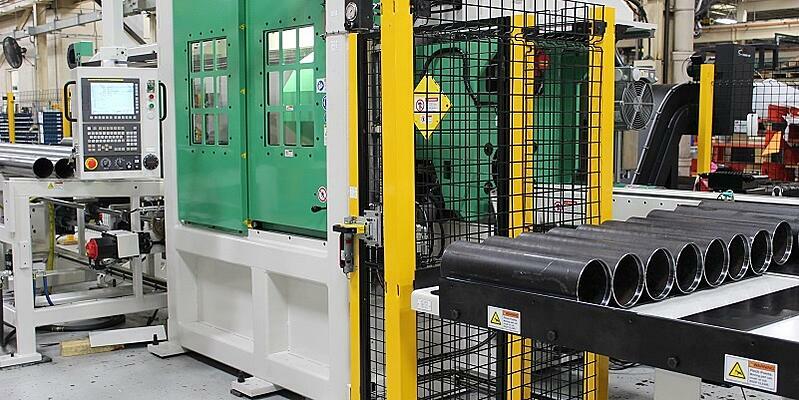 As a FANUC robotics integrator, Bardons & Oliver’s RH-Flex Series tube cutting machine provides flexibility and customization when paired with FANUC robotics. When you choose our RH-Flex Series automatic tube cutoff machine, operational efficiencies increase and operating costs decrease. Machines in this series can run unattended for hours, saving labor costs. Whether you’re processing straight cutoffs or cutoffs with chamfers and bores, the RH-Flex tube cutoff lathe operates for your needs. Cuts only the tube wall, unlike a saw that “recuts” hardened chips and shaves that collect in the tube I.D. Bardons & Oliver’s employee-owners can solve your manufacturing challenges. We’ve been engineering full-service Machine Tool and Contract Machining challenges for more than a century.